Interventional Radiology has exploded as a specialty in recent years and there is now a huge range of procedures that can be performed with imaging guidance by Radiologists. In our department we have two IR suites with low-dose fluoroscopy units, both of which have the ability to obtain CT images if additional detail is required during procedures. There is also a six-bed recovery bay in the IR section. Our Radiologists have admitting rights in the hospital should patients require an overnight stay following a procedure, however the majority of IR procedures can be performed on a day-case basis, with patients discharged home from the department on the same day (unless, of course, the patient is already an inpatient in the hospital). Femoral artery access for an arterial embolization. The majority of IR procedures require a combination of both ultrasound and fluoroscopy guidance. Ultrasound is used initially to gain access to a hollow structure with a needle, for example an artery, the biliary tree, a renal calyx or an abscess cavity. Once the needle is in the correct position, a guide-wire is passed through it under fluoroscopic visualization, the needle is removed, and an appropriate plastic catheter is advanced over the wire into the structure in question, through which the procedure can be carried out. 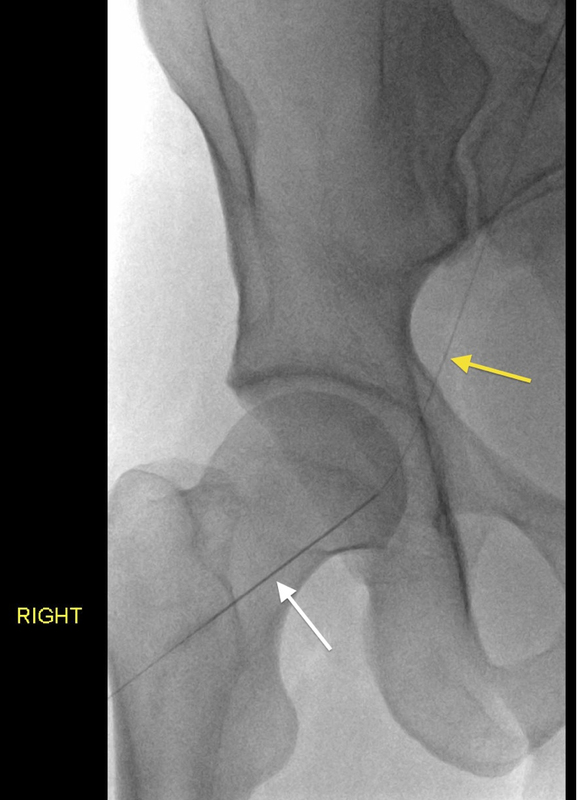 On the fluoro image on the left, the access needle (white arrow) has been introduced into the right femoral artery under ultrasound guidance. A guide wire (yellow arrow) has then been inserted through the needle and advanced into the aorta under fluoroscopic guidance. Pigtail drainage catheters. These contain a metal stiffener and are inserted over a guide wire. Note the multiple side holes in the end of the catheter on the left. The thin black thread, when pulled, gives the catheter its pigtail shape. 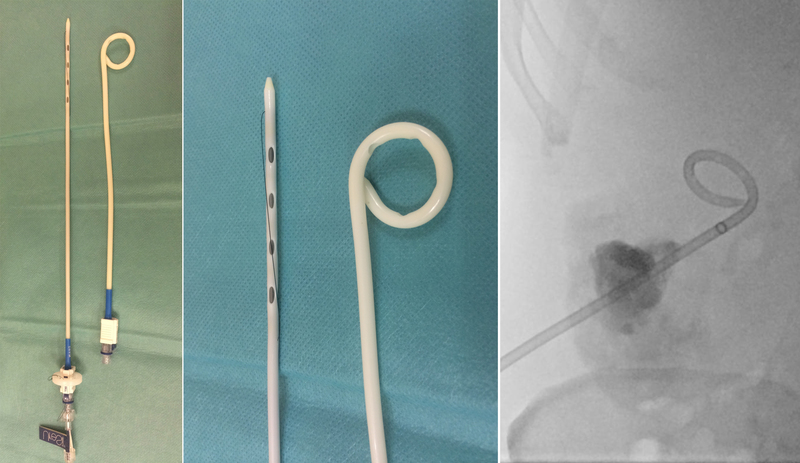 The image on the right, taken during an abscess drainage, shows what these look like on fluoroscopy. Most of these procedures are performed through tiny (subcentimetre) incisions, and are well-tolerated by patients when given a combination of local anaesthetic and conscious sedation (midazolam and fentanyl). A small number of IR procedures require general anaesthesia (for example, biliary drainage, hepatic arterial embolization, and radiofrequency ablation). IR procedures are subdivided into Vascular Interventional Radiology, Non-Vascular Interventional Radiology, Interventional Radiological Oncology and Musculoskeletal Interventional Radiology. Examples of the most commonly performed procedures in each of these categories are listed in the table below, and examples of each of these are provided in the biopsy and cases pages of this section of the website. As a guideline for this section, I have used the medical student curriculum advocated by the Cardiovascular and Interventional Society of Europe (CIRSE).